When you make new friends they often want to know about your family, this ESL family members vocabulary page will teach you lots of the words you will need to be able to talk about your family. After looking at this page you will be able to talk to people about your family. The first part of this page is a vocabulary list with definitions. This list contains all the vocabulary you will need to be able to describe families. Try to learn as many of the words as possible. To help you do this there are some flashcards that you can download to use when you are away from your computer. Then there is a recording of the vocabulary being spoken by a native English speaker so you can hear the correct pronunciation. Below is the ESL family members vocabulary list. You should learn as much as you can by looking at the words and the definitions. It can also be used as a reference source for when you find a word you do not know: just come and look it up. Then there are the flashcards with pictures that you can download, and finally the recording of the ESL family members vocabulary being pronounced by a native English speaker. The flashcards of the ESL family members vocabulary in this section can be downloaded and printed out so you can carry them with you wherever you go. Just click on the picture or link to start the download. This part of the page has the ESL family members vocabulary presented as two recordings. The first is a simple recording that you can listen to. Then the second one is a video in which you can see the flashcards being shown at the same time as the words are pronounced by a native English speaker. Listen as often as you need to so that you can learn the correct way to say the words. In this ESL family members vocabulary task you need to select the best option (A-D) that corresponds to the word given in each question. At the end of the questions there is a link to click that will show you the correct answers. 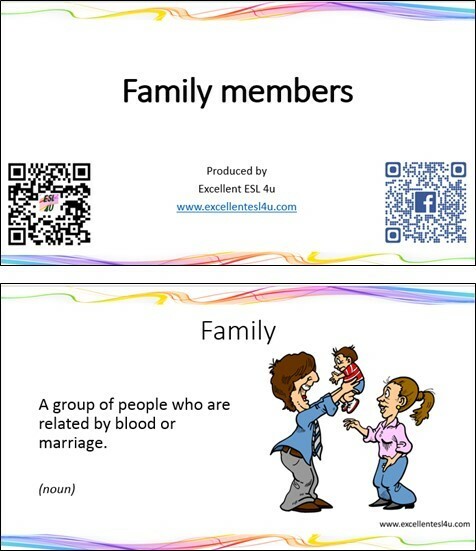 Choose the correct definition for the family members vocabulary in this quiz. 1) What is the definition of Adult? A) The time when a baby comes out of its mother’s body. B) A man on his wedding day. C) A person who has finished growing and is no longer a child. D) A man who has never been married. 2) What is the definition of Divorced? A) To be no longer married to your wife or husband. B) A group of people who are related by blood or marriage. C) To look after a child and teach him or her how to behave, etc. D) Someone who is related by blood to a person who lived a long time ago. 3) What is the definition of Girl? A) A group of people who are related by blood or marriage. B) Relating to women or girls. C) The woman to whom a man is engaged. D) A female child or a young female person. 4) What is the definition of Labor? A) The process of childbirth from the start of contractions to delivery. B) The child of your son or daughter. C) Having a husband, wife or life partner. D) A brother who is the son of either your mother or your father. 5) What is the definition of Sibling? A) Having lived for a very long time. B) To care for and educate a child until adulthood. C) A brother or sister of the same parents. D) The daughter of your stepparent or the person who is married to your parent. This next ESL family members vocabulary activity is similar to the one above, only this time the definition is given in the questions and you need to choose the word (A-D) that goes with the definition. Again you can use the following link to see the correct answers. 1) What is the meaning of the following definition: A woman whose husband has died and who has not married again? 2) What is the meaning of the following definition: A girl or woman who has the same parents as you? 3) What is the meaning of the following definition: No longer alive, to be dead? 4) What is the meaning of the following definition: The father of your mother or father (same as grandpa)? 5) What is the meaning of the following definition: A drawing that shows the names of all family members over generations and how they are related to each other? 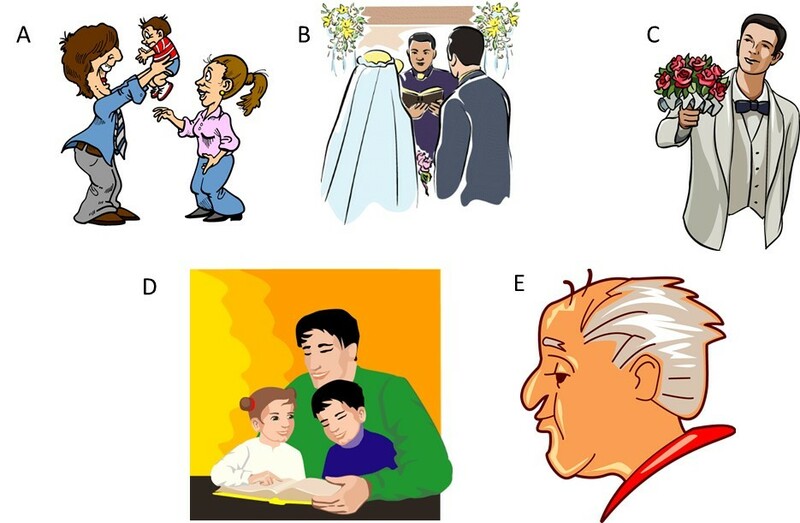 In the final ESL family members vocabulary exercise you need to decide which option (A-D) in each question matches each of the following pictures. When you have answered all the questions you can again use the link at the end of the questions to see your score.